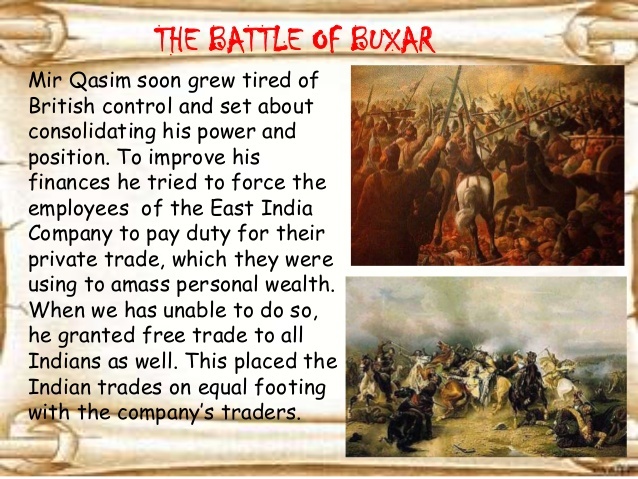 The Battle of Buxar was fought between the British East India Company and the coalition forces of the Nawabs of Bengal and Awadh and the Mughal emperor. The East India Company's forces were led by Major Hector Monroe whereas the Indian coalition forces were led by Mir Qasim- the Nawab of Bengal, Shuja Ud Daula- the Nawab of Awadh, and Shah Alam II the Mughal emperor. The battle was fought at Buxar which currently is in Bihar, on 23rd October 1764. Buxar was in Bengal at that time. After the Battle of Plassey, Mir Qasim sat on the throne of Bengal as its Nawab. Mir Qasim was an independent and skilled Nawab, Bengal had ever seen. He introduced several reforms during his reign, for example the expenditure on administration and palaces were reduced and he redirected those funds to manufacture fire locks and guns. In his reign, new taxes were imposed and the capital, which was previously Monghiyar, was shifted to Murshidabad. The increase in tax collection resulted in regular payment of salaries to the standing army. All these reforms annoyed the officials of the British East India Company as they only wanted Mir Qasim to be a puppet Nawab whereas Mir Qasim had always tried to keep himself away from the influence of the British. This caused a number of conflicts between him and the British. Before the Battle of Buxar was fought, Mir Qasim was defeated between thrice from June to September 1763. As a result of these successive defeats, he was forced to flee Bengal to Allahabad where he met Shuja Ud Daula, the Nawab of Awadh. At the same time, Shah Alam II had just took the throne as the Mughal emperor and he wanted to bind several states as one physically stronger Empire which included Bengal. At that time Bengal included the areas of Bihar and Orissa. To achieve this goal, Shah Alam II first needed to overthrow the British dominance over this area. However he was unable to overpower them. So he took shelter under Shuja Ud Daula. Now, Shuja Ud Daula had always wanted to destroy the English Supremacy in the Bengal region. Therefore the three rulers joined their hands against the British and the main cause of conflict became the share of Bengal. They declared war against the East India Company on 23rd October 1764 at a place called Katkauli which is six Kilometers from Buxar. Just like the Battle of Plassey, the battle of Buxar also did not last more than a few hours but it also registered itself as one of the most significant battles ever fought in the Indian history. In the Battle of Buxar, the combined forces of India contained 40000 men while the British East India Company fought with only 10000 men out of which 7000 were from the British army. The Indian forces were led by Shah Alam II, Shuja Ud Daula and Mir Qasim while the East India Company's forces were led by major Hector Monroe. Lord Clive was absent at that time and was in England. In the battle, 847 soldiers of the British forces were killed while more than 2000 soldiers from the Indian side were killed. After the battle, the British made a stone memorial at Katkauli in remembrance of the fallen soldiers. The battle was won by the British East India Company in the leadership of major Hector Monroe. The three combined forces of Mir Qasim, Shah Alam II and Shuja Ud Daula got defeated under the leadership of Major Munro. After the defeat, Mir Qasim fled to the North- West and died there. Shah Alam II left the company of Shuja Ud Daula and took shelter in the British camp. Shuja Ud Daula was the only left leader who tried to defeat the British until the year 1765, but was unsuccessful. He also had to flee to Rohilkhand. According to major historians, the main cause of defeat of the Indian forces was the lack of coordination among leaders. One of the immediate consequences of the Battle of Buxar was that it lead to the Allahabad treaty between Lord Robert Clive and Mughal emperor Shah Alam II. After the defeat of Nawab Mir Qasim, the era of Nawabs came to an end. With the victory at Buxar, the British East India Company secured the Diwani rights or the fiscal rights which meant that the East India Company could now manage the revenues of large areas. To give you an estimate of the area under the company’s dominance, I would say that it included Bihar, Jharkhand, Uttar Pradesh, West Bengal and even some parts of Bangladesh. To secure these fiscal rights, the British made a treaty with the Mughal emperor Shah Alam II under which the Company would give 26 lakh rupees to the Mughal emperor. After being victorious at Buxar, the company’s army moved towards Awadh and gained control over Banaras and Allahabad. Shuja Ud Daula had to pay the Company 50 lakh rupees as expenses of war and 25 lakh rupees more in installments. The Allahabad treaty made the dominance of the British over Eastern India, official. The Treaty also provided for a few men from the Company's Army to be placed at the Allahabad fort which had now become the fort of the Mughal emperor. They were placed their for the protection of the emperor. 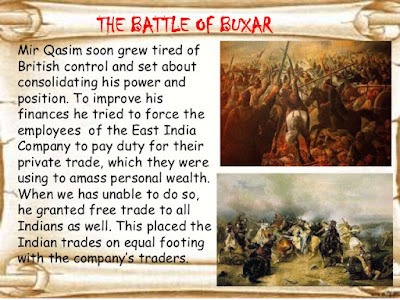 The Battle of Plassey may have laid down the foundation of the British East India Company's dominance over Bengal, but the Battle of Buxar cemented their roots. Major Hector Monroe, following the footsteps of Robert Clive, strengthened the East India Company's position and dominance over the whole of Bengal. Revenues which were collected from states of Bengal, Bihar and Orissa went straight to the company’s treasury. This brought the Mughal emperor under total influence of the British East India Company. Moreover the Company now had full authority and control over the army, finances and revenues of the region. The responsibility to collect these revenues rested with the Nawabs but they had no influence or power. With all these revenues collected, the Company now had enough funds to carry out their plans of expansion. According to the British history, Ramsey Muir, the Battle of Buxar finally riveted the shackles of the Company's rule in Bengal.